The Safety 1st High-Def Digital Color Video Monitor provides a 100% clear connection anytime, anywhere. Its state of the art wideband audio clarity ensures no static, no interference, and guaranteed privacy while monitoring. DataLock technology means no dropped picture or sound. Indoor/outdoor range is 650+ ft. Overall the video monitor works great and has no interference. I have the summer infant one & we love it but it's NOT the digital one so it only has 2 channels on it so we can see our neighbor's child on it on the one channel. We didn't mind nor did they BUT when we had our 2nd child, we needed the ability to see both kids from 1 camera so the summer infant one was no longer an option although we LOVED it. So this camera had a better picture quality than the Summer Infant digital one. Also the Summer Infant digital one was too too bulky and big and the screen size was small. The one drawback to this monitor is that the screen is not 2.5 like our old Summer Infant one but because it has a nice zoom feature, it made up for it. We really like it so far and there are no interference issues. The other drawback to this monitor is that when you use it with just the rechargeable batteries, it only allows you to view the baby for a breif few minutes (maybe like 1 or 2 mins max) when you hit the view button. Our Summer Infant one used to keep it on for a bit longer than that so I'm not constantly having to hit the "view" button to see the baby. On the other hand though, you can plug it into the AC adaptor and then you have the ability to view the baby nonstop and the screen doesn't shut off. I suppose they have the auto screen shut off to save batteries. Read other reviews before purchasing this. Good picture, especially in the dark. A major point for me was that this was "WiFi friendly" - BUT - we have found that since using this monitor our wireless network seems to disappear for a while, then come back later, sometimes a long time later. I haven't yet worked out if it's the camera being on, or the receiver unit (I'm thinking maybe it could send as well - as we seem to get problems when we turn it on, although the camera is on all the time). A few times I have plugged the receiver in to charge for a few hours, but when disconnecting the charger it complains that the battery is flat. Not sure if it's just a bad connection or a problem with the unit, but 99% of the time it's OK. Flashing light on the power switch is annoying too - can't be disabled and may distract a child. Yes I can confirm that when turning on the receiver, this is what seems to kill the wireless network - and it does do so every time. Strange that it is the receiver not the transmitter. The camera is left on all the time and wireless works fine. This video monitor was our 3rd purchase. We first bought Summer's Video Monitor which was returned even before we had the baby. The first reason was because we would pick up or neighbors baby room, second the monitor screen broke very easily. Next Monitor we purchased was Graco's, we actually used this monitor for the first 9 months, the video clarity was poor, and the parent unit of the monitor would turn off unexpectedly. At first I thought the rechargeable battery was just bad so I purchased a second plug in cord for the unit only to realize that was not actually the issue. After 2 months of dealing with their customer service they gave me a full refund for the return of my unit. Moving on to the Safety 1st monitor when I first received the monitor the parent screen I though was really small compared to my other two previously owned. However once I turned on the camera and observed the clarity of the unit I was impressed! I would Highly recommended this unit above all other video monitors. There are some negatives about the unit when hanging the video camera the power cord seems to be located in the wrong spot. It is located on the bottom part of the unit so there is no way to hide the cord. Second is I am still a little confused on how to switch between options. But even with these two negative factors the video picture by far is the best quality out on the market. Hope this helps. Good Luck! I should preface this by saying we live in a 1450 sq. foot condo. I first tried the First Alert. Too much noise static. Then we got the Summer Infant with 2.5" screen. It was defective from the get-go. We have had no static or interference with the Safety first. You need a lot of light to see the image in color, but that's really not important to me. It goes into "sleep" mode, where the image blanks out and comes on when my daughter makes noise (or when I manually turn it back on). This feature didn't even work on the previous monitors I tried. Great monitor. Clear picture. Good sound. Little feedback. One BIG problem. It kills your wireless network. Another writer commented that he was unsure whether this device was interfering. I can attest, with certainty, that is it. We're running the new N class Apple AirPort as well. Not an old router. The interference in sporadic, but when it hits your network goes down and for a number of minutes. I think this is an overall great unit. It is probably an order of magnitude better than non-digital solutions. The picture and sound do not have any interference on them (but there are some digital artifacts from compression). The zoom and pan feature (available when zoomed in 2x or 4x) doesn't actually cause the video camera to physically move, but it is still a useful feature (we use it almost all the time). The "High-Def" is nice but doesn't mean its 720p or 1080i! Also, I was able to use the unit without reading the manual, though I picked up some good information after looking at it. Overall it seems to work really well but there is some room for improvement. The night vision doesn't work so well if the camera is more than a few feet away from the subject. I also wish it had a mode that would automatically turn on the video monitor when motion was detected. There are a lot artifacts if there is a lot of motion, but since this is a baby monitor, if used as a baby monitor, then it's not a problem. It doesn't come with AA batteries for the camera, but the camera is capable of running on batteries (3 AA's). The included 3xAAA batteries are for the monitor. UPDATE 2008-12-18: We have been using this for months now. It has been dropped many times on laminate flooring and is still working. The flashing green light on the camera is a bit annoying to our child so we cover it up when needed. All in all, we're still very happy with this purchase even though it's not perfect (battery life could be better and had to "reset" the camera at least once to get it to not overexpose). Been using for 4 months non-stop! Purchased this after much review and comparison. Talked to others I know and box store employees. Amazon had the best price so I went for it. Had no issue setting up the monitor or connecting to the handset. The color feature was very nice, but like other reviewers here have noted, unless the room is extremely bright, the feed defaults to B&W. That wasn't a big problem for my wife and I. The night vision works well. Sound feature - the first night we put my daughter in the bed rather than the crib (the whole reason for buying it), I had it on setting one (soft sounds turn it on). When we woke up the next morning - my daughter was UNDER the bed sleeping. We did not hear a thing and my wife is 9 months pregnant and due to that, not a sound sleeper. Since then we have had the sound ON all the time. The slight static when the sound is on is not as loud as our old Graco monitor, but it is there. I have three problems with it - two are minor and one is major. First, the camera does not stand well on its own if you tilt the lens. I understand it is meant to be mounted but I would have liked the base part to have a little more weight. Second, sometimes the camera does not focus when you turn on the viewer - all you see is static. I have gotten around this by zooming in and then zooming out. That normally resets the picture. The first time this happened I thought it was broken and played with it for about 25 minutes - standing in the same room - and could not get it to focus. Since then the issue is intermittent. Finally (the deal breaker): this thing KILLS your wireless network. If you are running 2.4GHz wireless G forget it. With the monitor in the next room away from the computer I am only pulling down about 1Mb. If I bring the monitor downstairs, I get between 11 and 18Mb. Forget file sharing. I need to decide (and soon) if I want to return it. I may downgrade to a 900Mhz model. I just printed the RMA for this item and will be sending it back tomorrow after trying it out for two days. 2) I liked the idea of a secure digital signal for AV monitoring that the next runner-up unit did not have. - The video picture was fairly clear, and did not seem subject to any interference that we could see. Interference in general did not appear to be an issue with this unit, nor did it appear to interfere with our wi-fi system at home. - The user interface is horrid. There seems to be little logic or consistency with the way most small electronic devices work today. - It is an energy hog. The batteries, after fully charging them, only last about six or seven hours, then the unit starts beeping, lots, loudly, until the batteries are truly dead. OK, I get it, if the batteries are needed to listen to baby, then it is good to be warned of the lack of monitoring. Too bad that three 850 milliamp hour batteries can only power it for a few hours, when it is only on 'monitor' mode without being viewed or becoming active in any way. How much power does it take to be a passive receiver from a powered transmitter? A smart device would use very little power (like a small radio) and then only 'power up' the rest of its electronics when it receives a valid signal from its dedicated transmitter. - Very poor VOX operation. We have a three year old Sony audio only unit that had no 'trigger level' adjustment. It comes on at the slightest noise in baby's room (small child now). Unfortunately, it also frequently made noises from who-knows-what interference. This new Safety 1st unit, purchased for our about to be born #2, was tested from our older child's room. The new unit has three 'level' settings so that you can set when it comes on. This sounds great. Unfortunately, the most sensitive setting would not pick up on a normal conversation in our son's room and stay on! We even thought that maybe the level settings were backwards from the manual and tried 'less sensitive' level three. I think level three requires a lawnmower or a shriek to turn on the unit. On level one, the 'sensitive' setting, a normal conversation in close proximity would intermittently turn the unit on and off. This was the last straw, what good is a monitor that does not have a decent VOX capability? Maybe we got a bad unit? Possible, but the rest of the unit's quality was such that we won't bother to find out. - Annoying logo every time you look at the screen. When you want to see what is going on, and press the 'view' button to do so, you are first subjected to a 'safety 1st' flash screen for a couple of seconds or so! Good grief! My baby might be making a horrible noise and 'Safety 1st' prefers to stick an add in my face and remind me that they made the product rather then allow the product to do the job it was purchased for as quickly and efficiently as possible! - It seems to take very bright light to get a color image, even in fairly decent to moderate light (sunny mid day; medium weight drapes closed in the room, but door still open in a well lit home), the unit switches to B&W images. I could go on, but you get the drift, bottom line, we won't buy another 'Safety 1st' product. This was their high end item and in our opinion, they failed to satisfy. The best monitor you can buy! Not sure what other monitors are like, but from what I heard other ppl sometimes see babies of their neighbours and such. This never happened. Also, very clear color picture (day) good quality night vision image and amplified sound make this unit worth the cost. 1. PICTURE. This monitor has by far the best picture of any baby video monitor I have seen. That being said, it is NOT "high-def" to the standards of a high-def television. It is high def compared to other monitors currently available. 5 STARS. 2. SOUND. The sound quality is very good. There is a soft "whoosh" of interference that is constantly in the background when the receiver is on. I have never seen a monitor that didn't have that interference, and this is better than most. The microphone appears to be very sensitive and picks up my child's smallest sounds. 4 STARS. 3. RECEPTION. The reception is unparalleled in my opinion. There is only an occasional blip of interference on one side of the picture that resolves quickly. We walked three houses away on either side of our house before we lost reception. Needless to say the reception inside our home and in our yard is flawless. Even several houses away the reception didn't degrade in quality - it was perfect until it was lost, displaying a lost connection symbol. A few steps back toward our house restored perfect reception again. Additionally, the monitor does not appear to conflict with our wireless internet in any way. 5 STARS. 4. PAN/TILT. This monitor advertises the ability to pan and tilt. If you are picturing being able to remotely control the camera to move in any direction, that's not what it does. From the remote parent unit, you can zoom in on the picture 2X to 4X. While in a zoomed view, you can move right, left, up or down within the picture, just as you would if you zoomed in on a picture from your digital camera. You're not actually seeing anything outside the original view, and the camera is not actually moving. The zoom feature does produce fairly clear images, however, and for us we like being able to see both our kids in their bunk beds in the zoomed out view, and then zoom in on each one individually. I find it slightly irritating that to move within the zoomed view you have to keep pushing the right, left, up or down buttons repeatedly, moving only slightly with each push. I wish you could hold down the button and have it move smoothly until you released the button or reached the edge of the picture. 4 STARS. 5. TIME OUT and OTHER FEATURES. This monitor has an on-screen menu that allows you to set your preferences for the Time Out feature, AUTO level, Night vision (infrared) and adding other cameras. TIME OUT allows you to set how long your want the screen to be on before it automatically shuts off to save battery life - 5 seconds, 15 secs, 25 secs, or OFF which leaves it on until you turn it off. I really like this feature because you can hit the view button to see the picture and then just set it down and it will turn itself off. The sound continues after the screen turns off unless you have set the AUTO LEVEL, which turns the sound off and then turns it on if there is a sound in the room. You can set this to OFF, which keeps the sound on until you turn the unit off, or to level 1, 2 or 3 which makes it more or less sensitive to sound, i.e., it will turn the sound on for smaller noises on level 1 or wait for bigger noises on level 2 or 3. I like this a lot because then you don't have to listen to the "whoosh" of background noise, but you know if your child starts to stir it will turn back on. I am satisfied with how sensitive it is with my 3 year old, I will wait and see how I feel with the baby coming soon, knowing I'll be more paranoid about every noise with him. But so far I like how this works. For NIGHT vision you can turn the infrared on, off, or to auto. I don't know why you would use anything other than auto but I guess it's nice to have the choice. I only have one camera so the part about adding other cameras is not something I can comment on. I will say the menu was only partially intuitive for me, but it didn't hurt me to read the instructions for once and all my questions were answered there. 5 STARS. 6. OTHER. In the area of nit-pickiness, there is a Safety 1st screen that comes on every time you turn the screen on, as if it shows while the unit is booting up. Whether this is necessary or not I don't know, and it does bug a little, but it's only on there for 1 second so it's not that big of a deal. The screen does return to the view you had before, like if you were zoomed in on a certain spot it returns to that, which is nice. You don't have to find the view you want all over again. The screen is pretty small, smaller than our old one, but the picture is so much better it makes up for it. I would rather have a smaller, but better picture than a bigger crappy one. I do like that the handheld receiver is small and portable, easy to carry in your pocket or use the clip provided. Finally, the power button on the camera blinks brightly when the camera is on, which can be annoying in the dark. I taped tin foil over it to cover it up. Overall, I would recommend this monitor to family and friends without hesitation. 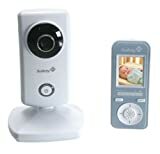 I am sure that future models with improve upon this one, and there are some things I would change if I could, but I am convinced this is among the best if not the best baby monitor available today. I love it. Shop around for the best price.